SANT’AGOSTINO DI FERRARA | One of the worst quakes to hit northeast Italy in hundreds of years rattled the region around Bologna early Sunday, killing at least seven people, collapsing factories and sending residents running into the streets, emergency services said. The magnitude-6.0 temblor struck at 4:04 a.m., with its epicenter about 22 miles north of Bologna at a relatively shallow depth of 3.2 miles, the U.S. Geological Survey said. Civil defense agency official Adriano Gumina said the quake was the worst in the region since the 1300s. It left bell towers cracked, chunks of church facades lying in the streets, and roofs caved in. Agency chief Franco Gabrielli put the death toll from quake damage at four – all overnight-shift factory workers who died as buildings collapsed in three separate locations. In addition, he said, two women died – apparently of heart attacks possibly sparked by fear, shortly after the quake rocked the area. Sky TG24 TV reported one of them was about 100 years old. Mr. Gabrielli said “dozens” were injured, although it was too soon for a definitive count. TEHRAN | President Mahmoud Ahmadinejad said Thursday that he is eager to attend the Olympic Games in London to support Iranian athletes but that Britain doesn’t want to host him. Ahmadinejad was quoted by the official IRNA news agency as saying he would like to be “beside Iranian athletes” during the games but that the British are reluctant to have him. “I would like to be next to our young athletes at the 2012 Olympics but the host has a problem with this,” said Ahmadinejad during a meeting with Iranian athletes who have qualified for the Olympics. Ahmadinejad did not specify whether he has officially requested to attend the games or say if Britain has refused him entry. So far some 50 Iranian athletes have qualified to participate in the Olympics in several sports, including weightlifting, wrestling, shooting, track and field, and table tennis. JERUSALEM | Israeli ministers held a special Cabinet meeting at Ammunition Hill on Sunday to celebrate Jerusalem Day, when the Jewish state captured the Arab eastern sector 45 years ago during the Six-Day War. Celebrations were lined up throughout the day with formal ceremonies, parties and the annual flag march through East Jerusalem to mark the “reunification” of the city that took place after the 1967 Middle East war. Palestinians claim East Jerusalem as the capital of a future Palestinian state. The Cabinet meeting was held at Ammunition Hill in East Jerusalem, a former Jordanian military post that saw some of the bloodiest fighting and now houses preserved trenches, battle fortifications and a museum. During the meeting, the Cabinet decided to allocate $91 million to create public spaces in Jerusalem over the next six years in a bid to develop tourism and infrastructure, a statement from Prime Minister Benjamin Netanyahu’s office said. b) How large was the earthquake? b) Ahmadinejad did not specify whether he has officially requested to attend the games or say if Britain has refused him entry. Read the information under “Background” below the questions. Do you think the British government should refuse Ahmadinejad entry to Britain? Explain your answer. b) Read about the Six-Day war under “Resources” below. Who do you think should control Jerusalem? Explain your answer. The magnitude 6.0 earthquake that struck north of Italy’s Bologna region has also destroyed the community’s cheese industry. Sunday’s quake destroyed more than 300,000 wheels of Parmesan and Grana Padano, a similar cheese, with an estimated value of more than $320 million according to the NZHerald. 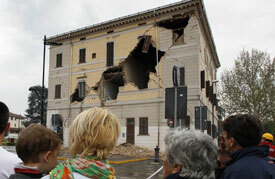 Stefano Berni, head of the Grana Padano consortium, told the ANSA news agency, “The earthquake was very strong and heavily damaged the structures of many warehouses as well as thousands of tonnes.” He called the initial estimate of 250 million euros (USD 320 million) very conservative. Britain has been in a standoff with Iran over the country’s nuclear program, which the West [says] is aimed at producing a [nuclear] weapon. Iran denies the charge, insisting the program is for peaceful purposes only. In 2011, Britain cut ties with Iran and closed its embassy in Tehran after militant Iranian students stormed the mission. The raid followed a move by Iranian lawmakers to decrease relations and allegation of hostile British policies toward Tehran. Last year Iran objected to the logo for the 2012 Olympics, contending it was racist because the symbol vaguely resembled the word “Zion,” according to Iranian authorities. There was even a warning of a possible Iranian pullout of the games but that threat was later dropped.